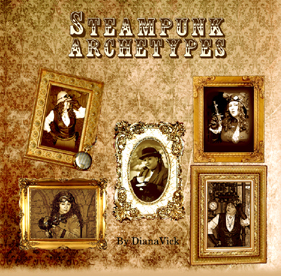 My Steampunk Archetypes Book Is Now Available! For the past few years I have been dressing up in steampunk attire for events and gatherings. I enjoy it immensely and try to be as creative as I can. When I first got started I found it immensely helpful to imagine a few steampunk archetypes and think about what they would wear. Since then I have been writing and lecturing about that topic. Since I had so many photos, I decided to take advantage of the current print on demand services and make a little book on the topic as well. You can preview and purchase a copy here. I hope you find it entertaining.